How well the Bhendi/Bhindi/Okra/Bendekai is described by these two dear girls :) This slimy vegetable tops my list of favourite vegetable. Once you know how to handle this gooey goodness, you are sure to fall in love with it (it was true in my case, can't talk for others :). I like my bhindi cooked in a very simple way without much frills. It’s very common in our home to have minimum of two side dishes along with Rice or Roties for dinner and I give full credit to my Amma and MIL for spoiling us when we were kids. With hectic schedule at work place it's become a habit to reach home at late evenings. During these times and days there are few recipes which come to my rescue that not only take few minutes to cook but also taste delicious. 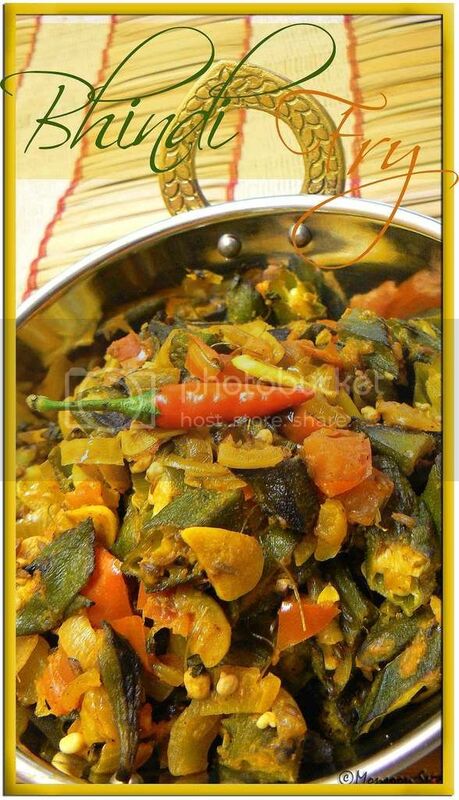 One such recipe is Bhindi Fry which is served in almost every Indian Restaurants and Takeaways. Other than it being my favourite dish to order at restaurants, I love to cook it at home on regular basis. Sometimes it’s best to apply KISS (short for Keep It Simple and Straightforward) principle when it comes to cooking and Bhindi Fry is a fine example for it (Aha… now you know why I mentioned Bheja Fry in my post title ;). My recipe for Bhindi fry is quite simple and straight forward where fresh okra is pan fried with onion and tomatoes and few spices. While the onion gives it a crunch, tomato imparts little sour note. 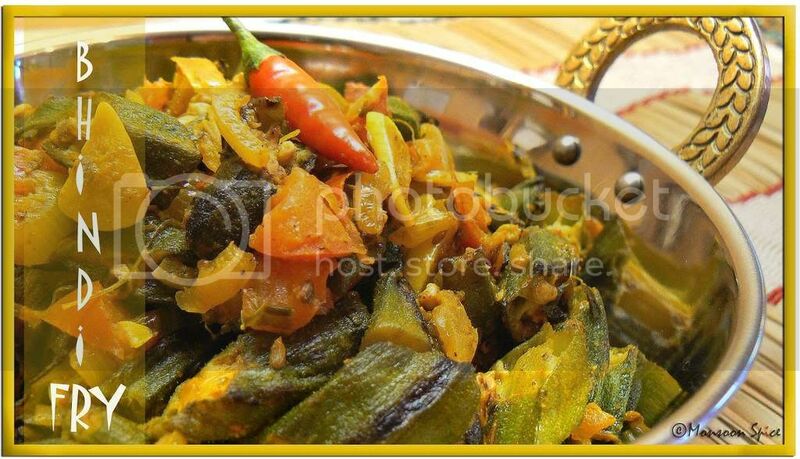 The spices used are minimal to keep natural sweetness of the bhindi/okra intact. Well, I never said you need to compromise on taste department even when the recipe calls for few minutes of your time. Cook this Bhindi Fry when you don’t have much time to spend in your kitchen and also when ever you feel like eating something light yet delicious. Heat 1 tbsp of oil in a pan and add okra/bhindi to it. Sauté them on high to medium flame continuously till the sliminess is reduced and they start to brown. It should take around 5-8 minutes in total. In another pan heat 1 tsp of oil and add cumin seeds to it. When they sizzle, add finely chopped onion. Sauté the onion till it turns translucent. Now add slit green chilli, finely chopped garlic and ginger and sauté till onion turns golden brown in colour. Mix in garam masala and turmeric powder and sauté for another minute till you get nice aroma of spices. Add finely chopped tomatoes, sugar if using and cook on a medium flame for about a minute or two. I like the tomatoes little undercooked. If you prefer, you can cook for little longer till the tomato releases its juice and becomes pulpy. Mix in amchur or lime juice, fried okra, and salt to taste and keep stirring for another 3-5 minutes till all the flavours blend well. Serve this garnished with fresh coriander leaves and enjoy with chapatti or rice. How can you explain a dish so good. While reading the last paragraph i was drooling. I have to admit okra is not my favourite veggie, in kerala my mom used to make them a lot. I like the veggie but not favourite. WOW.... Bhindi Fry looks YUM!. Nice capture. 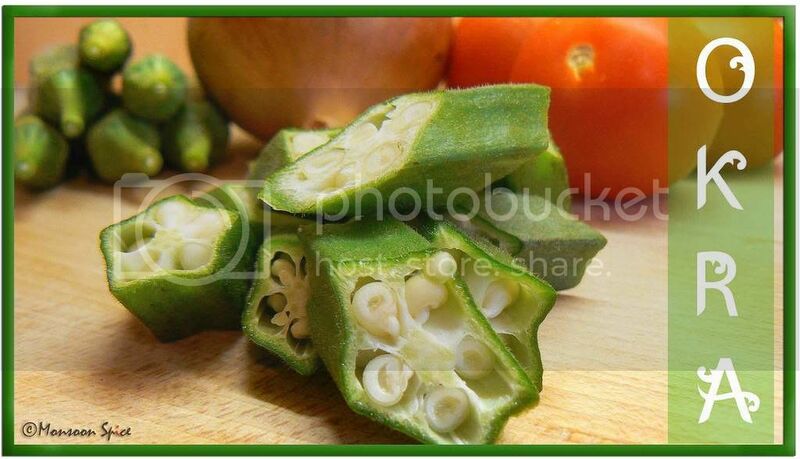 That was a nice description of okra. Love ur recipe. Looks absolutely divine, it is 4 pm at my end now and I am famished looking at your pictures. I love Bhindi Fry, what camera do you use, the quality of your pictures is amazing. You came again with lovely pics. Hi Sia, riddles, writings and great recipe...a true bheja fry :). My parents used "bheja fry" a lot when we were eating their heads... I remember being taught KISS at marketing class - Keep it Simple Stupid. Recipe is the perfect example!! Oooh! That looks so delicious! The riddle was a nice one..Siri and DK are doing a grand job..
And I thought Sia Wordsworth was getting more prolific :) Have you tried microwaving the bhindi, it takes only 4-5 minutes to cook it that way. 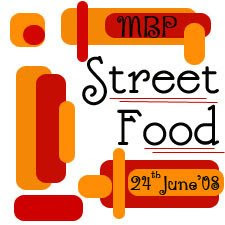 You can check my blog for the micro recipe. I love Bhindi Fry ... Have never tried it this way!